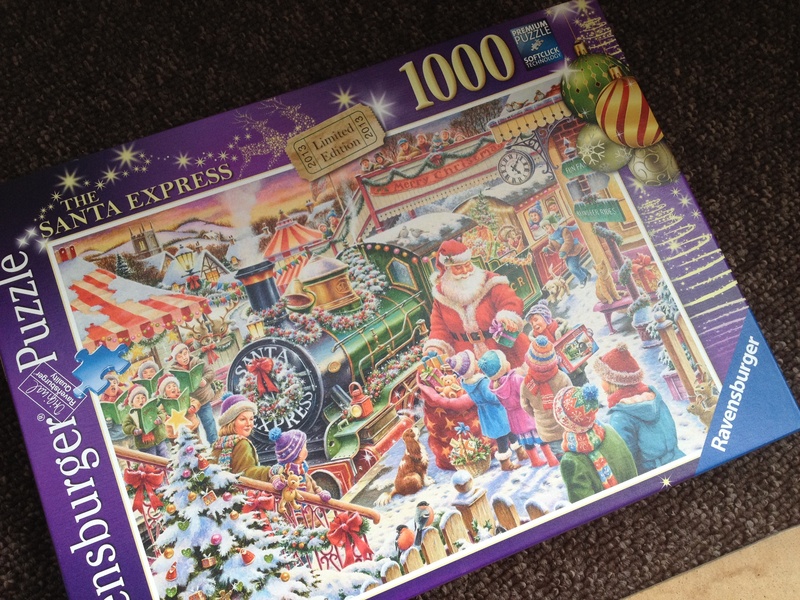 1000 piece festive jigsaw – who would do that? Jigsaws were not at the top of my ‘must do activity list’ on returning back to the UK. 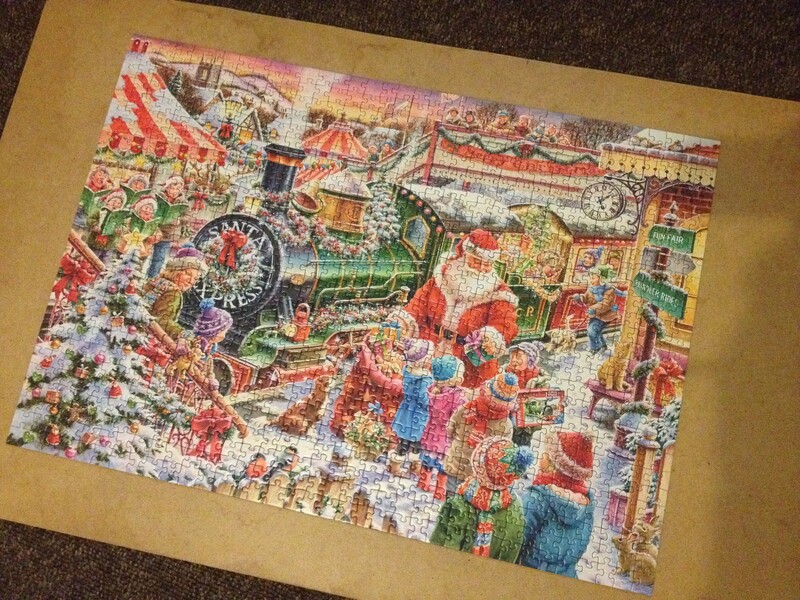 Mother has always insisted on a family jigsaw around Christmas time and for some reason brought one up with her when visiting our new house last month. 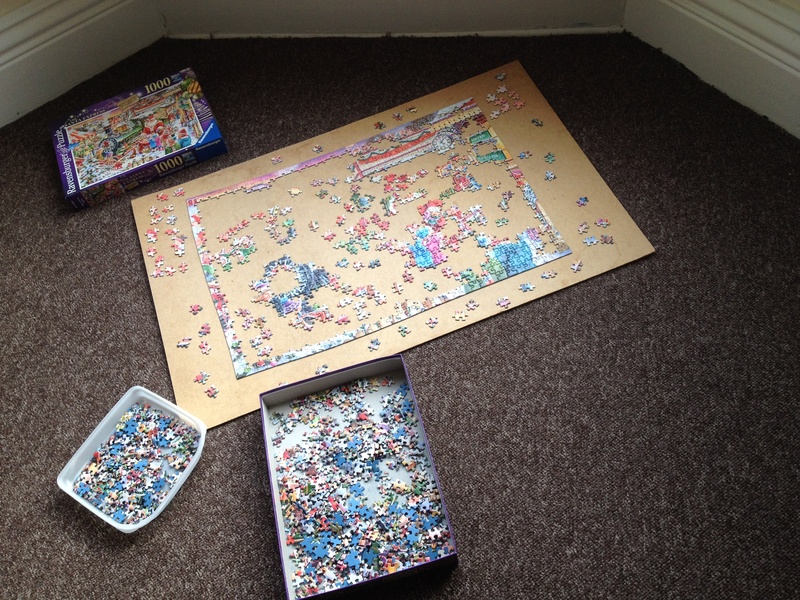 I did have to question why she thought it a necessity to pack a jigsaw, and the specially tailored homemade plywood board for doing jigsaws on, and impose it on us when we are just settling in to a new routine and way of life and trying really hard to de-clutter. I acknowledged it and quickly tucked it to one side in the back room with other boxes and items that could be forgotten about for the time being. The festive jigsaw didn’t stay tucked away for long though as over the weekend of her visit she persuaded me to open it up suggesting “it would be a nice family activity to do over the Christmas period.” So we plonked the plywood jigsaw board in the middle of the living room carpet and opened the musty box of 1000 intricate pieces of cardboard and started looking for the edges. Both my older kids asked “why are we looking for edges dad?” both thinking they would start putting together the big santa being the main feature in the middle of the puzzle. I explained carefully the importance of a patient approach to jigsaws like this one and forming the perimeter or boundaries of the picture first before constructing the images in the centre – “we need to no what we are working with and where our limits are.” I gave them the challenge to look for the four corners and they eagerly set about searching for them as if it was a festive Christmas dip. 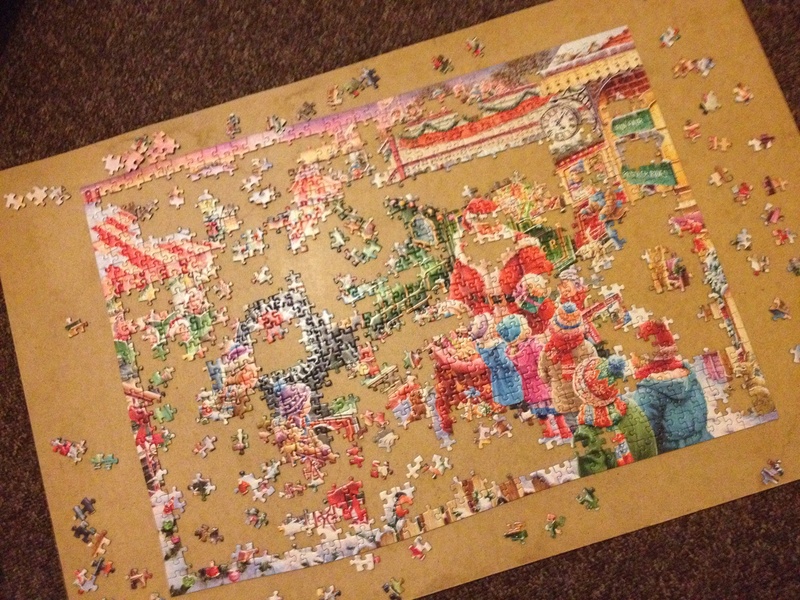 The thing with jigsaws is that they take time to get going. You have to be resilient and focused to get beyond the early stages of locating corners and edges and sorting similar colours, shades and patterns. It can be a lonely affair in those early stages with no sign of a successful completion in sight. It is always better if you can recruit a team of jigsaw helpers and all agree on a role for each other – delegating specific shades and patterns to be found, distributing personalised collection and sorting (Tupperware) boxes for maximum effect and ownership. This organised and strategic approach is key to jigsaw teamwork and avoiding the ultimate chaos and predictable disaster of vigilante jigsaw building when every one is in it for themselves and not thinking big picture. There is an addictive satisfaction to that click of a jigsaw piece slotting neatly into place. In the box a midst hundreds of other coloured pieces a single piece is lost and has no sense of place and is easily overlooked as multiple hands rake through the box on their own agenda. The picture on the front becomes key, this is your guide – the code to success, the plan that enables you to focus on what you are trying to achieve. It also gives you the confidence to know what unique pattern is required to make the selection of other shades and colours complete and form the picture you have been working on. Even though it looks nothing like it in the box each piece plays a key role and you must put in the time to look for the right one and find it. Clicking pieces into place is a satisfying process and encourages you to continue doing it (long into the night!) – and before you know it you have 1000 little pieces all coming together and the picture is clear. This entry was posted in A Team Player, Challenged with a Sense of Personal Adventure, Reflective Practice by Paul Crouch. Bookmark the permalink.